He supplied me with the original pencil drawing and a print. He expressed a preference to keep the original pencil drawing intact, if possible. We discussed inking the print, but it was kind of dark and muddy. I had suggested making a lighter print of my own and ink that. But then I decided to try something different… and do something the same way. I used the original pencil drawing under a piece of Canson Bristol (my current favourite for drawing/inking) and put it on a light table. I was able to ink directly from what I could see of the pencils through the Bristol and used the print as a reference for the areas that were hard to see. That saved me from having to make a print that I would ink over and enabled me to use my preferred paper. 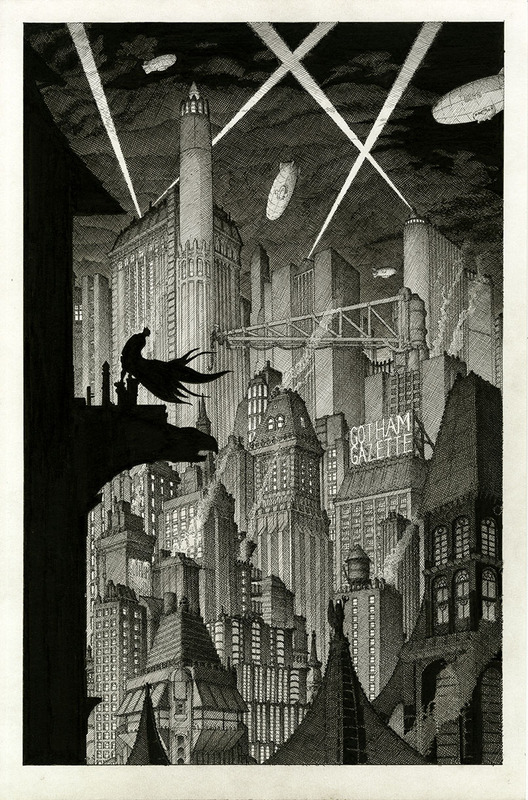 I had just finished the ‘Monkshood’ commission a couple weeks ago and decided that ‘Gotham Nights’ would benefit from the same sort of treatment. If I had inked on top of the original pencils, I probably would have done it completely differently and tried to keep closer to the original. But I figured Duane wanted me to ‘Gerhard-it-up’ (which usually means thousands upon thousands of tiny little lines) and I wanted to make it look more like night-time as well as try to give a sense of depth. 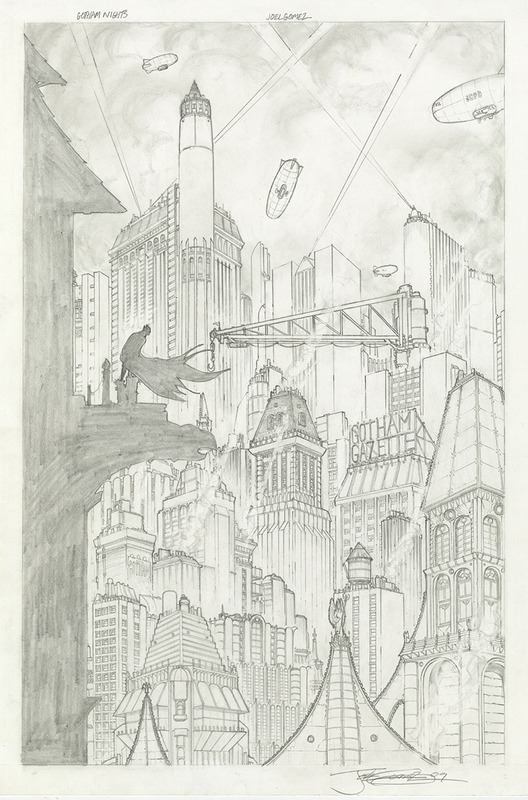 I used a light grey wash on the sky and on the foreground buildings to enhance the effect. Holy smokes this turned out amazing! Been a huge fan of your work for a long time man. Was always impressed with what you and Dave brought to the indie comics scene. Truly an honor sir. Seeing this made my week! This was an interesting piece to ink. Great composition. I don’t usually ink other people’s pencils. So far, there’s been you and and Berni Wrightson.